The National Ambient Air Quality Standards, or NAAQS, are one of the key aspects of the CAA used to maintain or improve air quality. These standards put a cap on the amount of certain pollutants, referred to as criteria pollutants, which are allowed in the atmosphere. The pollutants and their standards have been set by the EPA in response to the latest available research on air quality and human health. 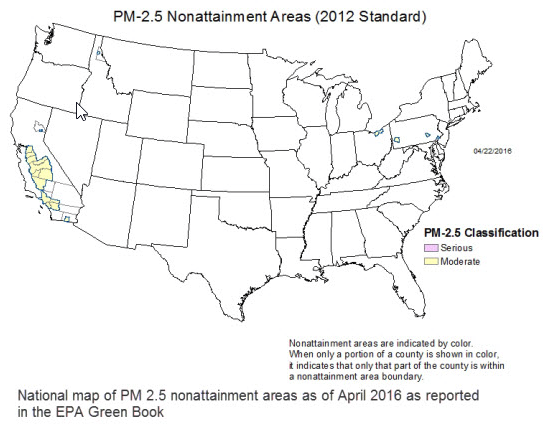 The criteria pollutants most relevant to fire are particulate matter (PM) and ozone. Fires have the potential to emit large quantities of these pollutants sufficient to affect public health, and hinder a State's compliance with air quality regulations. Every five years the EPA reviews the latest available science regarding air pollutants and human heath, and revises the NAAQS accordingly. When this revision is finalized varies by the pollutant. For example, new standards for particulate matter were finalized in 2012, while new standards for ozone were finalized in late 2015. Because increasingly stringent standards may make it more difficult to conduct prescribed burns that emit PM or form ozone, it is important to be aware when NAAQS are updated. Some ways to stay informed on likely changes include contacting your local air regulatory agency, or visiting the EPA’s NAAQS page, selecting your pollutant of interest, and checking the ‘regulatory actions’ page for that pollutant. For the EPA Green Book which outlines nonattainment areas for the various NAAQS pollutants, click here.